DFT® Inc. proudly holds a certificate from the independent, not-for-profit corporation, 3-A Sanitary Standards, Inc. This particular certification speaks to the measures DFT® Inc. takes to ensure each valve meets sanitary standards for design and fabrication. Used across a variety of industries, these standards are of the most stringent cleanliness codes. DFT® offers Clean-in-place (CIP) valves for pharmaceutical, food, and beverage industries. As a 3-A certified organization, DFT® Inc. holds its operations to the highest level of both quality and cleanliness. 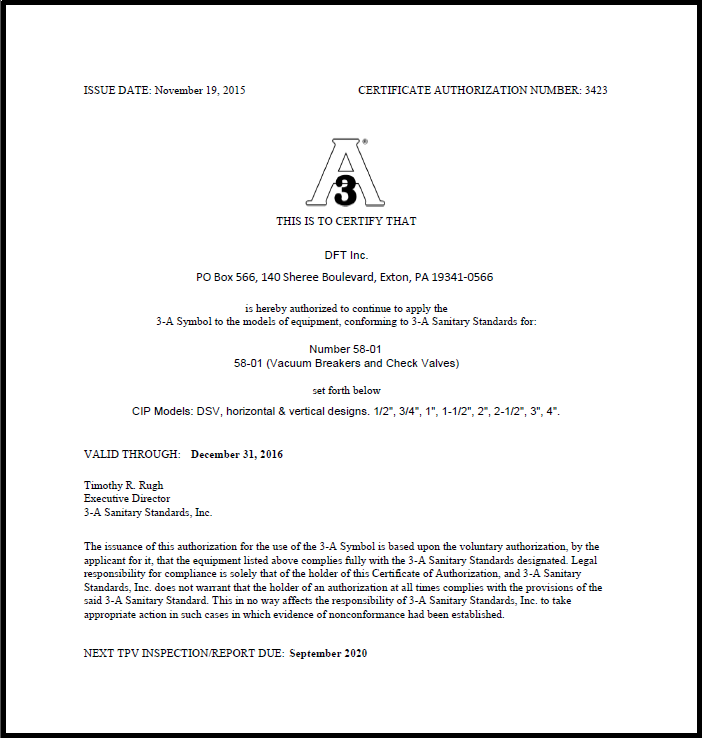 Download a free copy of our 3-A certificate by filling out the form.